No matter what you need for your office, you will likely find it at Office Furniture Unlimited’s 40,000 square foot showroom. The most popular styles and makes of new office furniture is maintained instock for immediate delivery or pick-up. Some of the more popular lines that we carry include, Hon, Alma, Myrtle Desk, A.G.I., Herman Miller, Riverside, Steelcase, All-Steel, Boling, Knowl, Kimball, D.M.I., Davis and Global. Whether you are looking for case goods, conference room furnishings, panels and partitions, training room furniture, seating, workstations, files and storage cabinets, you will find it here from the lines manufacturers such as Office Source (Rudnick), Mayline, Lesbro, Virco and Offices To Go by Global. If equipping your office with high quality furniture at an affordable price is your goal, then the Office Furniture To Go line of products is ideal for you. You will find the Offices to Go line of products is kept in our showroom ready for you to fully examine and test. This superior manufacturer is known for the exceptional style and comfort of its seating line. You have the option of choosing, Multi-function, Task, Mesh, Management, Leather (Luxhide) side and stack chairs for whatever seating needs your office requires. In addition the Office To Go line of casegoods has excellent variety and quality. The Superior laminate desking system emphasizes clean contenporary sitting and premium construction. 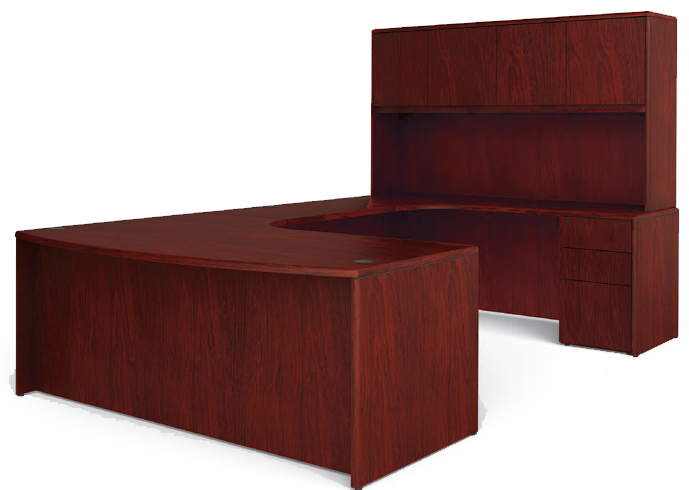 This line comes in Executive Desks, L-Shaped, U-Shaped, Pedastal, Reception with complimentary Bookcases and Credenzas. This series can be configured to suite any office furnishing needs. And if there is something that you require from this line and it happens to not be in our showroom, we will be able to get it in quickly for you. If you are really looking to make an impression with your office set-up, our Traditional Veneer Oxmoor Collection from DMI might be just the thing to give your office the high-powered CEO look. This beautiful dark finished desk seems like it belongs in the bank president’s corner office. The Oxmoor collection got it it’s name from a grand old estate in Kentucky and the styling and detail in this classic piece makes an impressive statement. The rich Merlot Cherry finish and Antique Brass hardware sets this majestic desk apart. Fluted pilasters and madrone burl accents are the type of detail you rarely see in a piece of office furniture, but call attention to the desk and the owner as elegant. However if you are a little more modern in taste, the Contemporary Collection from Office Source will make your office look like it’s well advanced into the 21st century. It doesn’t matter whether your taste is old school or futuristic, you will find plenty of options for new funiture at our huge showroom on Lee Street in Greensboro, North Carolina. We’ve been providing quality furniture at this location since 1992. If you are located in High Point or Winston-Salem and need furniture it is just a short drive to our location which is easily accessible from I-40 and I-85. We are just a short distance from the Greensboro Coliseum.